This had to be one of the most exciting events we’ve done with Events and Adventures Chicago all summer! First we expressed our artistic side with splatter painting a canvas. Some people got very creative and enhanced their art with tape designs and some glitter! We were able to make over 20 paint colors…which allowed everyone’s masterpiece to look different. 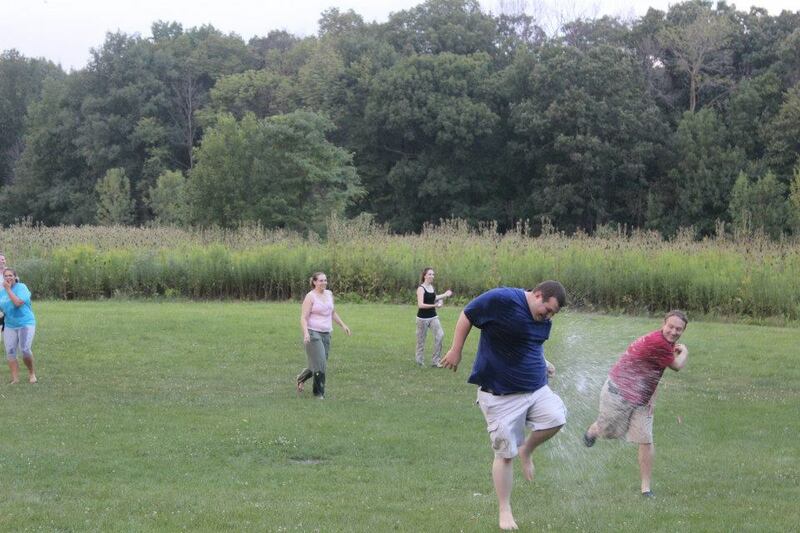 And just when we were done relaxing with painting…we got some aggression out with a water balloon fight! Almost 450 water balloons were gone within 4 minutes! Everyone had a blast! And practically no one walked away dry… It was a night we won’t soon forget! Thanks all you Chicago Singles! The night was crisp and clear, and hung high in the dark sky was a dazzling full moon. We had to celebrate this lunar delight, and what better way than at Howl at the Moon! We tipped back cocktails and sang at the top of our lungs with our dueling piano accompaniment. Since we E&Aers were obviously the coolest people there, we dominated the dance floor. We mad new friends and danced the night away! At one point we even stole the spot light when we were invited up on stage to show off our moves! The music was so great that some of the ladies even abandoned their heels to keep dancing! Now that’s what I call having your priorities straight! I think the Chicago club made that full moon proud! Salt Does More Than Just Enhance Flavor! This definitely tops the chart with the coolest thing I’ve done all month…a salt cave! As I walked inside, salt crunched under my feet like sand on a beach and the walls sparkled with salt crystals. We sat back in our reclining chairs and snuggled up in our blankets. We laid back and chatted about our days. Shortly the lights dimmed and calming sounds of the ocean played as we nestled in. This unique experience was more than just relaxing. The air inside the cave was beneficial on many levels. The components of natural sea salts that filled the air have a concentration which promote several areas of health. Who knew this hidden gem was tucked away right here in our city? After a long, hard day at work, it was great to relax with some friendly E&A faces and try something new! It’s Tuesday night after a long day of work. Most people head home to put on their sweats and plop in front of the TV all night. Not us. That’s not E&A’s style! Instead, we met up for a relaxing evening of wine, painting and friends! The night began with sipping and sampling the different wines we brought. We relaxed on plush couches and snacked on fresh baked breads accompanied by infused oils and vinegars. We took time to unwind, meet new members and talk about our day. Then it was time for the real fun to start! We each selected our desired photo and attempted to recreate it with paint and a blank canvas. At first it was a bit intimidating, but it wasn’t long before my painting was well on its way! Just when I thought i was stuck, help was close by. E&A had a private painting session which came with two of our very own instructors! Whenever we needed guidance or supplies they were right there waiting to help us. Even if we didn’t need anything at all they were there with compliments and encouragement! And when we were indulged and focused on our paintings, they brought to our attention when the local commuter train pulled up to the station across the street. For those of you that were there, you know what I mean. Let’s just say it was a reminder to take a break, breathe and sip your wine. (We liked train breaks). At the end of the evening it was great to see how many of us chose the same picture to paint and how differently they each turned out. The colors, the shapes, the strokes of the brushes…they were all impressively beautiful! It was obvious to me how each of our characters were expressed through our art. We all have our own style and uniqueness…And that’s what E&A is all about. Coming together to be who we are! Some of us have similarities and some of us have differences. That is why the club works! That is why we love it and have a blast! Chicago’s biggest event yet!!! And guess who was there? Super woman! Captain Jack Sparrow! And the Energizer Bunny! That’s right…I am talking about the Halloween Bash, and boy was it is FUN!!! Our first annual Halloween Party was so awesome that it carried into the wee hours of the morning! The company was great! The band rocked! The costumes were spectacular! It was so refreshing to see each other out of the ordinary. Dressing up simply makes you feel like a kid again, and we all need that every once in a while! Our VIP loft was perfect for dancing or just relaxing and mingling on the comfy couches. Plus, it was only steps away from the band. We had the best of both worlds! E&A created a night of great fun, friends and memories. We have the pictures to prove it! It Was A Dark And Stormy Night……. Cue spooky music…It was a dark and stormy night…Well maybe not “stormy” but it was drizzly and cold! The line was so long that we thought we would turn into zombies before we got to the end, but we didn’t mind too much. We had good company. There were 50 E&A members hanging out and we were on a mission! There had been a zombie out break and it was up to us to save mankind! We were loaded onto hay wagons and each assigned a paintball gun. Then we took off into the night. Things were calm at first but then zombies started coming at us from all sides and it was our job to mow them down with our paintball guns! There were a few close calls, but by the end we felt invincible! After that we ventured out on foot through the pitch black corn maze with nothing but our flashlights to protect us! We weren’t sure if we would all made it out alive, but we did, and would do it again in a heartbeat! At the end of the night we eliminated the zombies and gained new E&A friends!